Late versions of the Super-Multi-Coated Takumars feature a tiny pin that prevents the movement of the Auto/Man clutch unless mounted on a screwmount body or used with a special cap off the camera. The standard Takumar cap will not press the pin down. If you don't have a third-party cap that does the trick, press the pin in with you fingernail and then slide the clutch over to manual. 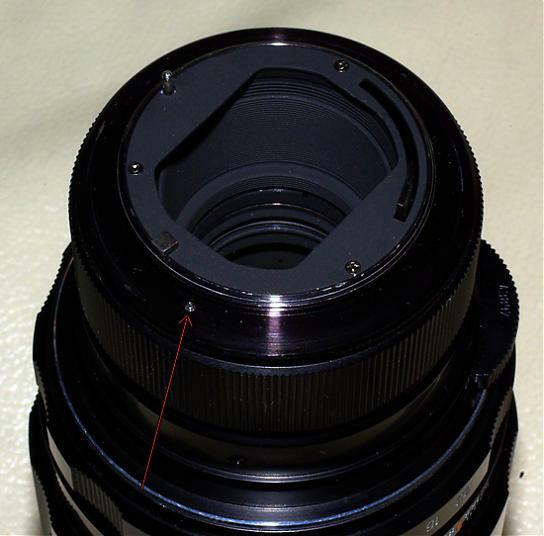 It must remain in this position if you intend to adapt a screwmount lens onta a bayonet SLR (including DSLRs). If the clutch is stuck even while mounted, make sure the lens is screwed all the way in, or try taping the pin down! You're a lifesaver. I just received my first M42 lens (S-M-C 105mm 2.8) and this was precisely the information I needed! My SMC takumar 35mm f/3.5 has this pin on it too, it was quite a surprise when I got it. I believe the later Pentax (Takumar) caps have an extra little "flange" along the bottom edge that covers this pin. I noticed that it was not possible to switch between manual and auto when my S-M-C was on my Spotmatic F, but would work on my Spotmatic. After going back and forth, the reason became clear, The later Spotmatic F had a recess next to the thread opening, and the pin fell into this rather than be pressed in. Why they wanted this feature to lock it into auto, I don't know. * (see below) You have to unscrew the lens to change over, and then holding the pin in. * Basically the reason seems to be that they wanted to prevent going to manual when you had an open meter camera like the F and later models. I notice that in Auto, one doesn't have to switch on the light meter, it reads light when the lens cover is removed. If one were able to inadvertently select Manual it would throw confusion into metering. Last edited by arnold; 11-28-2012 at 05:23 PM. Reason: More Info. my Pentax Super-Multi-Coated Takumar 200mm f/4.0 No. 8178571 got the Auto-Manual switch stuck even if the pin is pressed. It feels like the pin being glues to it's position. What should I try in which sequence ? I would try really giving it a push. Is it still stuck when mounted on a camera? As newbie, this just happened to me today, as I picked up a mint Super Multicoated Takumar 200 from a local Craigslister (Whoooee... my 1st Tak!)... while inspecting the Tak in the local Mickey D's parking lot, I was able to easily move the "Auto Manual" switch, but when I got home and looked at the aperature blades, the switch was locked in Auto and would not move..!! Luckily, I stumbled upon this thread, cuz just pushing the pin with my thumb was not working, but placing/screwing the mount cap back on pushes the pin in just a little further than my thumb could, and released the switch. If you don't have the mount cap, you might be able to use a fingernail edge, small pin or end of a paper clip to push the pin in just a little bit further... hopefully, this will work for you too. Now all I need is a proper M42 to K mount adaptor to use this beautiful lense..!! I'm so glad that I looked for this "pin" answer before crying in a new thread. I've seen a lot of Pentax SLR bodies over the past 5 years, and even recently got a "S", but I don't think I've seen an "ESII" until tonight. It came with a SMC 1.4 50mm. The "Auto/Manual" switch was stuck, and I've never seen that happen before. Now I know that it WAS the pin that was locking it in place. I thought that it might have to be screwed on, even tightly for the switch to be change, but that didn't work. After reading this article, I used a pin on the pin, and the switch moved. Just remember that to use the Tac on a DSLR, the lens should be in the manual position, otherwise it will remain wide open no matter what you set on the lens. The camera can then be set on Av or Program. You can use camera 'manual' but then you have to push the green button for a speed. This is not required on P or Av. Bayonet lenses are another matter, as they have no manual position. Here 'manual' is required to be set on the camera in order for the camera to stop down the lens to the aperture selected. I love the M42s with the "Auto/Manual" switch! When I got my K5IIs I almost got rid of them, but realized that they work better on a DSLR than the "M" K-mount lenses that are newer, and more modern.